Painting runs in my family. 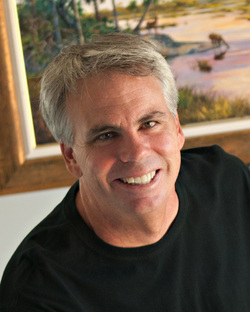 My father, James Hutchinson, is a nationally known and a Florida Artist Hall of Fame artist. My uncle was the well known painter, A.E. Backus, of Fort Pierce. Many days I spent watching my father paint so growing up an artist seemed natural to me. I was born and raised in South Florida. I lived a kid’s dream exploring back woods of Florida and Islands of the Bahamas. It was in these early years that I developed strong feelings for nature’s beauty and the deep desire to capture it through art. After high school, I continued my education at Brevard College in North Carolina. Completing the two year program I jumped across the country to finish my education at the University of Hawaii. Later I returned to Stuart for a short stint before heading of to Maine to study yacht design. Once again Florida called me back where I found work in a variety of commercial art positions. Eventually I settled into a company which allowed the use both of my artistic and yacht design skills. Later I launched my painting career as a full time artist. Each painting is unique in its approach. Several times a year, I set out in search of new material to paint. On these trips, I sketch and take many photos. Composition is very important to me. When developing the painting, I often pick and choose design elements to make a more dynamic artistic piece. On occasion, I just simply invent a scene based on composition alone. When starting a painting, I first develop sketches using photos and drawings done in the field. Next, I sketch straight onto the canvas and lay in large areas of color. Since I only paint in oil, I need to allow at least a day for things to dry. My paintings are created with layers of color and detail. Most of the work is done with brush but, I like to finish off with palette knife highlights. On occasion, I will do a purely pallet knife painting. These are more expressionistic in style and less realistic. They are free and move at a more rapid pace. However, I need to be in the correct mood to capture these images. They can’t be forced or the painting doesn’t work.